Singer Mariah Carey got engaged to Australian billionaire James Packer recently, and her engagement ring will make your eyes pop out of their sockets. It kinda beats everybody else’s effort by far! The 35 carat diamond ring has a centre stone surrounded by two tapered smaller stones in a platinum setting. That’s big huh? The average engagement ring is just one carat, and the legendary Hope Diamond is 45. A 35 carat diamond sold at auction for $9.57 million in 2012. We’ve attached a lot of mystique and value to diamonds that we dig out of the ground and romanticize about them when it comes to engagements, weddings and anniversaries. If you think a ‘huge rock’ would make a favourable impression on your future fiancé, or your wife, then maybe you should figure out a way to go capture a newly discovered white dwarf star astronomers are calling an Earth size diamond in space. The Universe knows about BIG! This freak star is essentially crystallised carbon and would have no peer in the envy it would foster in people who covet valuable stones. Immense gravitational pressure and heat over countless billions of years have turned this into a huge diamond, a giant floating piece of bling! Keen to buy? You’d better carry a deep wallet because this 10 billion trillion trillion carat monster has a cost that’s literally, well, astronomical! That’s a one followed by 34 zeros. You’d need a jeweller’s magnifying glass the size of the Sun to grade this gem. Seriously, how much would this status symbol cost you if you had the means to buy it? Words like a ‘gadzillion’ dollars’ comes to my mind! Sorry but it’s the best I can do! If you need a cool drink at this stage, be my guest! The next time you stargaze imagine how much real estate there is out there. And that’s not counting the rich mineralogy locked up in the planets and asteroids! Want to go bigger with a few more “awesomes”? Try the largest star ever found. 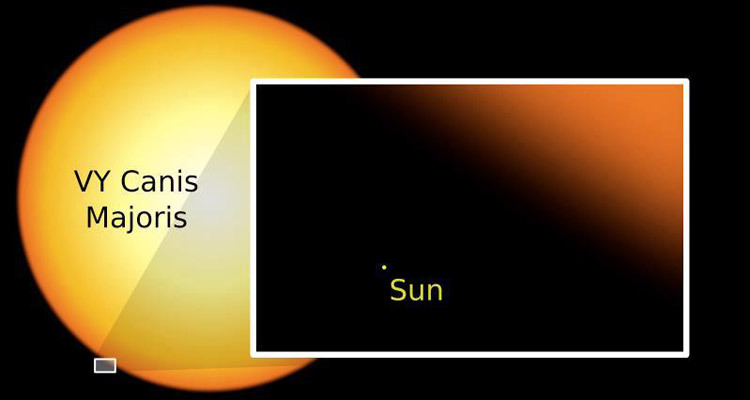 A giant named Canis Majoris is the largest star in the universe in terms of size. To give you some perspective, if we could take VY Canis Majoris and put it in our solar system in place of the sun, it would stick out of Saturn’s orbit. To give you some hard figures, the circumference of our Sun is 4.3 million kilometres, while Canis Majoris is approximately 3 billion kilometres. Yes, that is billion. For an easy comparison, when circling around the Sun, light clocks in at about 14 seconds. However, it takes almost 8 hours for a beam of light to travel around Canis Majoris. Awesome huh? Even if you were magically transported to Canis Majoris, a passenger airplane travelling at cruising speed of 900kilometres an hour would take over 1,100 years to complete one orbit! Which means that, if you started your trip around this star on the day that the Roman Empire was founded you would have just recently finished your journey circumnavigating Canis Majoris. Want another “awesome” moment. Thought so! Here’s an email that just arrived from a reader asking a “What happens to a bullet fired on the Moon?” OK, first, we know that the bullet exits the gun at the same speed on the moon as it does on the Earth. But as soon as it leaves the gun, it’s a different story, there’s no air resistance and little gravity. It can maintain its speed longer than the Earth bullet can. Assuming your bullet doesn’t hit anything and with no air resistance, the bullet will go about 6 times farther on the moon than on Earth. Now that’s awesome!